Size: 5.1" x 2.9" x 1.3"
The Exactra 22 is yet another member in the Exactra line from Texas Instruments. Compared to the Exactra 21 you'll notice an additional connector for an external power supply. 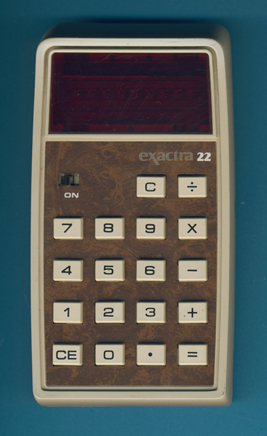 Dismantling the Exactra 22 revealed a small surprise, the LED-display found in this particular calculator was manufactured by Bowmar. We know the Opto-Stick display with its small numbers already from the TI-2500B. Don't miss an overview of all Exactra Calculator LED Displays. The printed circuit board (PCB) of the Exactra 22 seems to use similar schematics as the Exactra 21 but a different layout to accommodate the extra power connector. Don't miss the Exactra 23 loaded with all features.